This all-time popular cake recipe post just got a whole lot better! Now updated with step-by-step photos, so whether you’re a novice or experienced baker, you can easily bake up and savour this incredibly rich , marvellously moist and super buttery cake. Update! Dear readers, I hear you! You’ve been telling me how you all absolutely love the flavour of this cake, but would love to see how it’s really done. So, I’ve now included step-by-step photos, more detailed tips and instructions, which I hope will offer greater clarity and precision to your bakes. Which also means that this post just got a whole lot longer, but so much better, I promise! It’s so important to me that you can easily, confidently and successfully bake up this dreamy, rich and super moist butter cake. Skip right to the end of this post (just before the recipe) for my updates! If you had to imagine how traditional Nonya butter cakes used to be in the past, this would have to be it. Very rich, very decadent, very moist, and very, very buttery. Just sweet enough, with the lightest hint of vanilla. So simple, so basic, but so delicious. How can anyone resist a slice? 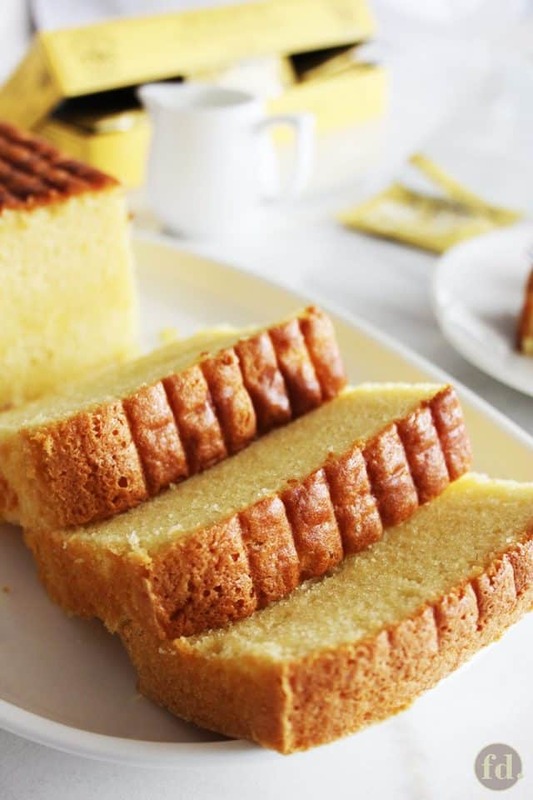 This rich butter cake reminds me of the time during my college years, when I used to have these crazy cravings for really rich Asian-style butter cakes, the kind that you can get your fingers greasy, just by touching. I know! May not be heart-healthy, but certainly taste-worthy! Living in Canada, I couldn’t exactly find any butter cake quite like it. Not even in the popular bakeries in Chinatown. Out of longing, I tried making my own from scratch. This was way before the era of the internet and the world wide web. Before I was able to afford my first recipe book. And when the only cooking shows I was even remotely aware of were ‘Wok with Yan’ and ‘The Martha Stewart Show’. I was renting the basement of a house at the time, which had half a kitchenette and three little windows. Actually, they were more like half-windows, as my landlady’s lawn always seemed to grow faster than she could keep up with the mowing. I barely had more than one or two large mixing bowls (which I used for, err… everything) and a long wooden spoon that served as a paddle beater, whisk and spatula all rolled into one. It was a blessing that my landlady’s oven even worked! Trying earnestly to recall how my father made his butter cakes, I had to ‘agak-agak’ (roughly estimate) all the ingredients. I had next-to-nothing for a recipe, save for sheer will and unfulfilled longing. Even when my amateur attempts were less than successful, but still perfectly edible, I was delighted that I could tuck into a slice of home-made butter cake. Every bite, morsel and crumb was savoured! Now, getting back to this cake, this rich butter cake is reminiscent of the traditional Nonya tea cakes of older days, being a recipe of a Peranakan culinary matriach, the late Mrs Leong Yee Soo. It seems to have withstood the test of time, and remains a beloved classic that hasn’t lost its appeal, nor fallen out of favour. A word of caution though, this is a indeed a very rich butter cake, with emphasis on ‘very rich‘! But it doesn’t mean that you shouldn’t try it, because you absolutely should! It really is a dreamy, delicious butter cake! Just in case, I’ve included a reduced butter amount next to the original recipe amount, so you can make a choice between ‘rich’ or ‘very rich’. This recipe makes enough batter for one large 20-cm (8-inch) square cake or 2 loaf cakes, so halve the ingredients if you want a regular sized cake or one loaf. If you’d love to try your hand at a good butter cake, but don’t want it this rich, you can’t go wrong with a pound cake, or for a light take, try these fruit-filled, fruit-flavoured butter cakes, such as German apple cake, fig and cherry cake, or this tangy lemon raspberry cake. UPDATE! So, are you ready to make this all-time classic, incredibly rich and super moist butter cake together, step-by-step? It’s really easy, and so rewarding. Let me show you how. To start, have all your ingredients at room temperature. Now, depending on where you live, room temperature could be anything from a cool, even chilly, kitchen, where it’s 18°C inside, in the middle of winter somewhere in the Northern Hemisphere. Or it could be a searing hot and humid 33°C if you live near the Equator (like here in Singapore)! But for most intensive purposes, it is widely regarded as between 19°C to 21°C. Chilled butter cuts and slices easily, so have it weighed and cubed once out of the chiller. It’ll probably need 20 to 25 minutes to come to room temperature, so you can go on to prep other ingredients. If you don’t have an instant-read thermometer, you can easily gauge when butter is ready for creaming by pressing your index finger lightly on its surface. The butter should give way slightly (you’ll see a slight indentation). It should feel cool to the touch, yet warm enough to spread. If it starts to get too soft before you’re ready to use it, pop it back into the chiller, but just long enough for it to firm up a little. Remember to take it out ahead of time, probably when you’re starting to whip up the egg whites. If your eggs are chilled, this is when you’ll want to separate the whites and yolks – it’s a lot easier. Separate cleanly and carefully – do not let a single streak of yolk taint your egg whites or else, the whites will not whip up (yolk=fat=grease). On this note, it’s also very important that the mixer bowl you’ll be using to whip up your whites is dry and completely grease-free. Once separated, eggs should be allowed to come to room temperature before whipping. Cold eggs will take longer to whip, and also do not whip as well as eggs at room temperature (which means less trapped air bubbles = less volume = denser batter). Next, weigh and sift flour and salt …twice, please. Try sifting from a height a couple of inches above the bowl, to incorporate more air into the flour. If your salt is coarse, and it stays on your sifter, just tip it over into your sifted flour. In a small bowl, combine the extracts and brandy (optional). Separately, prepare the condensed milk. In a dry and grease-free mixer bowl, pour in the egg whites. Using a hand-held or electric mixer, whip on medium-high speed until the whites start to turn foamy (like soapy bubbles). Stop the mixer, and spread the baking powder over the egg whites. Turn the mixer back on to medium-high speed, and whip to incorporate the baking powder. Then, add the sugar in a slow and steady stream, a little at a time. Continue whipping at medium-high speed until whites reach just stiff peaks – this may take several minutes. Lightly beat yolks before adding to the whipped egg mixture. Reduce mixer speed to medium. Drizzle in the yolks, a little at a time, and whip until well incorporated. Continue to whip for 1 minute after all the yolks have been added. The whipped egg mixture should be quite thick and fluffy at this point, and tinged evenly to a pale cream colour. Now, fit your mixer with the paddle attachment. In the cleaned mixer bowl, put in the butter (now at room temperature) and condensed milk. On medium speed, beat together, stopping occasionally to scrape down the sides and bottom of the bowl, until butter mixture turns a pale colour, and is light and fluffy (almost like whipped cream). Beat for 15 seconds to combine well. At this point, pour in 1 cup of the whipped egg mixture and beat until well incorporated, about 30 seconds. Here, you have two ways of going about this. If you are confident with your folding technique and ability, you can tip in all the flour, followed by the remaining egg mixture, altogether at once. I do it this way, as I feel that I can achieve a well-combined batter with fewer folds. Fewer folds will mean the batter will be less worked, and thus minimise the loss of trapped air bubbles that you’ve worked hard to whip up. I know it will seem like an enormous exercise to fold all that whipped egg mixture together with the flour, but you might just be surprised how manageable this batter becomes. Be sure to fold until the batter appears homogeneous and is even in consistency. Alternatively, you could fold in the flour mixture and the remaining egg mixture in 2 batches, alternating between the two. Keep your folding as light and gentle as possible, folding until batter is well combined and smooth. Your batter will feel a little heavy at this final stage, but is of pourable consistency, and can be tipped out into the greased pan. All that’s left to do is…BAKE!! Yayyy!!! Once the batter is poured into the greased pan, spread the batter to cover all the corners of the pan, and level the surface evenly. Give the cake pan a few gentle taps on the counter, to get rid of air pockets. Bake on an oven rack placed in the centre of the oven, for 10 mins at 175°C, then reduce oven temp to 135°C and continue to bake for another 1 hour to 1 hr 15 mins, or until done. This cake enjoys a slow, long bake (it is a pretty big cake, after all!) so do not be tempted to remove the cake until you’ve checked thoroughly for doneness. The baking times suggested here are guidelines, as each oven behaves differently. In fact, I recently replaced my old oven with a brand new one, and it seems to take me at least 20 minutes longer to bake this exact same recipe. So I usually use a couple of methods to assess when a cake is done baking. 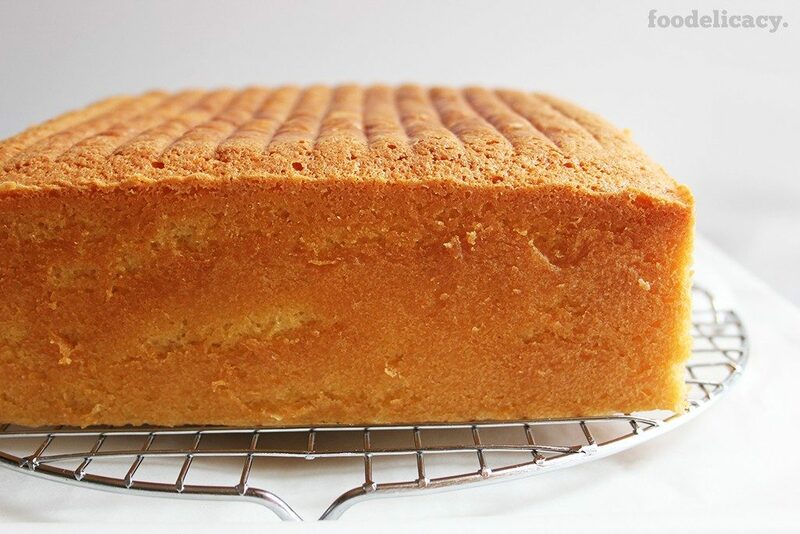 Using your sight, check to see if the cake surface has browned evenly to a deep golden brown, the centre of the cake has fully risen, and the cake has shrunk from the sides of the pan. Next, using your fingertips, press lightly in the centre of the cake – it is done if it feels firm to the touch and springs back. Finally, insert a bamboo or metal skewer in the centre of the cake – the cake is done if it emerges free of sticky batter. 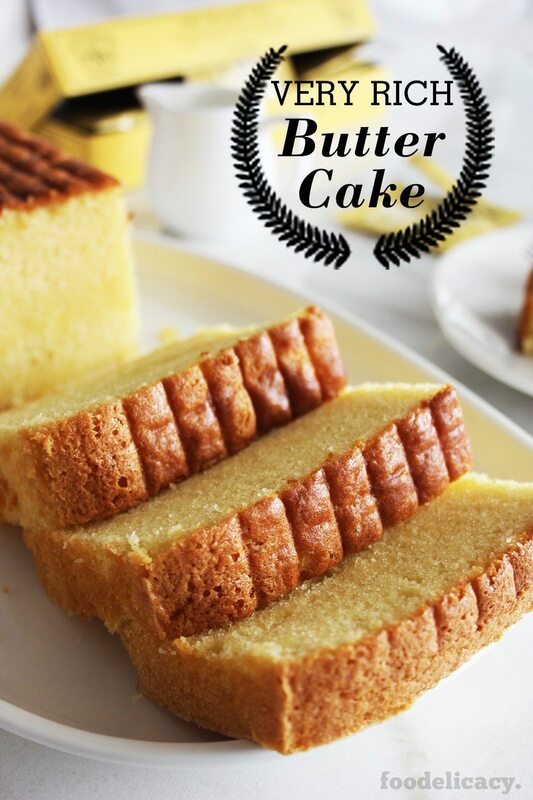 A simple and classic Nonya recipe for a very rich, moist and decadent butter cake with a light hint of vanilla flavour. (Adapted from source: 'The Best of Singapore Cooking' by Mrs Leong Yee Soo). Makes one 20-cm (8-inch) square cake or 2 loaf cakes. Pre-heat oven to 175 deg C (350 deg F). Place oven rack in the bottom one-third of the oven. Lightly grease the base and sides of cake pan with butter, and sprinkle lightly with flour. Tap out the excess flour. Sift flour with salt twice. In an electric mixer fitted with a whisk attachment, whip egg whites on medium-high speed (speed 4 on my Kitchen Aid mixer). Once whites get foamy, stop the mixer and sprinkle baking powder over the whites. Turn on the mixer, and whip to mix well. Add sugar, a little at a time, in a steady stream. Continue whipping on medium-high speed until thick or just about stiff peak stage. Reduce speed, and add the beaten egg yolks, a little at a time. Continue whipping for 1 minute after all the yolks have been added, until thick and creamy. Pour out into a large mixing bowl. Clean the mixer bowl and dry thoroughly. Place butter and condensed milk in the bowl. Using the electric mixer fitted with a paddle attachment, beat on medium speed (speed 3) until light and fluffy, about 5 minutes. Add almond essence, vanilla extract and brandy (if using), and beat for 15 seconds until well blended. Add one cup of egg mixture and beat for 30 seconds till well mixed. Fold in the flour-salt mixture lightly together with the rest of the egg mixture, all at once. Pour batter into the prepared cake pan. Level the surface evenly. Bake at 175 deg C (350 deg F) for 10 minutes. Reduce oven temperature to 135 deg C (275 deg F) and bake for a further 60 to 75 minutes, or until a metal skewer inserted into the centre of the cake emerges free of batter. When cake is done, remove pan from the oven and place on a cooling rack. Let the cake cool in the pan for 10 to 15 minutes, then turn out onto a cooling rack to cool completely. Thank you for writing in, Raiko! I hope you’ll enjoy this cake! Happy baking! This looks so delicious! I’ll definitely try this one! It’s also easy to bake. Can’t wait. Hi Shirley, yes, you can omit the brandy entirely. hi Celia, can I not adding the brandy ? Hi May, this is indeed unusual to hear, as this cake should be very moist given the amount of butter and sugar, though how moist we like a cake can be relative given our personal preferences. It would really help to know what the texture was like as well. Given the limited info, the likely possible causes I can think of could be (1) the baking time was a little too long thus drying out the cake a little, or (2) the cake pan was placed too close to the top heat, ideally the pan should sit in the lower half of the oven, or (3) the internal temperature of the oven heat could have been higher than the set temperature, in which case having an oven thermometer is very useful to make sure the oven is at the required temperature. It also makes a difference if your oven is fan-forced. If fan-forced, you need to drop oven temperature lower by 20°C to simulate conventional oven. Hope these suggestions can help! I halved the recipe and followed all the step. But the result was not that moist. I am trying to figure out which step I did wrongly. Thanks for the tips Celia. Will try as you suggest. Hi Ivy, I totally appreciate your frustration with ‘wet’ bottoms, it has happened in my bakes as well with a host of other cakes, not just this one, believe me! There could be several causes, so I thought it best to leave you with a couple of possible remedies. Yes, you could try baking for 10 to 15 mins longer, using top and bottom heat (you can cover the top of your cake pan with a baking sheet or aluminium foil to prevent the cake top from browning too much). Second, don’t let the cake sit in the pan for too long once it’s done baking and out of oven. All that hot steam needs to escape, and if the hot cake continues to sit in the pan, the steam will have nowhere to escape and will be re-absorbed into the bottom, causing slight wetness or soggyness. Try letting it sit for 5 mins, then free the sides of the cake from the pan by running a knife all around, and carefully flip over onto a cooling rack, bottom side facing up, and removevthe pan (this method has the advantage of giving the cake top the nice grid impressions, like the cake you see in my post, as well as a flatter, uniform cake top?). Let the cake cool upside down for at least 30 mins. Third, try halving this recipe and baking a smaller cake as mixing and folding techniques can work better with a smaller amount of batter, and baking results may be more consistent. I really, really hope that one or all of these will give you a thoroughly successful bake the next time. Don’t give up, ya? This cake is really worth all the effort! Hope to hear your good news! Hi Celia, Ivy here again. I didn’t use brown sugar opting to use caster sugar as per your recipe. I’ve baked this cake twice and followed your instructions PRECISELY. When I put in the skewer it came out clean both times. The top and sides are nice and brown. However, when I cut into the cake I noticed that the bottom was a bit dense and wet (both times). Should I add an extra 10 to 15 minutes using only bottom heat? I’m a bit frustrated as the cake tastes wonderful but I just can’t seem to get the bottom right. Awesome to hear this turned out well, Joyce! I also halve this recipe when it’s just for me and hubby too! Thank you so much for sharing! Hello Ivy, thank you very much for writing in. I’ve never tried this recipe with light brown sugar, but from what baking experience I’ve had using brown sugar, brown sugar has much higher moisture content and the distinct flavour of molasses, when compared to white sugar, and so will make your bakes more moist but also take on a different flavour than the original butter cake. This recipe as written will yield a very moist cake, if done well, so I would recommend not substituting with brown sugar if possible. However, I love to tweak recipes myself.. ha ha.. so maybe you could reduce the condensed milk to 3 tbsp, and substitute the white with equal amount or just 15 to 20% less, of brown sugar? I’m really interested to know how it works out if you do try this, hope you can share! Hi Celia. Your cake looks delicious and I can’t wait to try it. However, can I use light brown sugar instead of caster sugar and if yes how much should I use for this recipe? Hello Aisha, you don’t need to substitute the brandy at all. Just omit it altogether. Im non alcoholic. What can i use to substitute the brandy? 11 oz flour; 11 oz sugar; 16 oz butter (or 12.3 oz butter for less rich version). Hi Alaa, I’m sorry to hear it didn’t work out. To bake this cake, you need both top and bottom heat of the oven, with the cake pan placed in the lower half of the oven. Sounds like the sides of cake baked too quickly before the inside was done, sometimes this means the cake is placed too close to the top heat, or the temperature could be too high. Though margarine is a common substitute for butter, it is not recommended in baking where a recipe calls for butter, unless specified, as it has lower fat content and higher water content, so it will affect the texture of the cake. Margarine is also not as flavourful as butter. Hi dear thanks for the amazing cake .i tryed it on my visit to china but when i made it it was a complete failier . It was done from the edges and raw from the middle . Shoud i led the oven from top and bottom or only bottom . And can i use margrine insted of butter ? This recipe sounds wonderful, and I want to try it, but do you have the measurements in standard and not metric, please??? Hi Rachel, I’ve just written back to all your queries in one reply. Hoping for success for you! 1. Yes, rum is perfectly fine in place of brandy. 2. This cake batter is not as light or airy as cupcake batter, so I wouldn’t recommend it. 3. The eggs need to be fairly large eggs, between 60 to 62 gm in weight. 4. I use a Kitchen Aid Artisan series, 5-quart s/steel bowl, with up to 10 speeds (300 W). This mixer works fine for this recipe, but I have to say that you’ll need at least a 5-quart mixer bowl. I actually do all the folding by hand, where stated in the recipe, as using the mixer would risk over-beating the batter. If you find the quantity of cake batter too much to handle in the mixer bowl, you could transfer to a large mixing bowl that allows you to fold in the flour and egg mixtures more easily. 5. I don’t know of a suitable substitute for condensed milk, and can only suggest you leave it out entirely if you don’t wish to add it. However, the texture and flavour of the cake may not turn out as originally intended. I would usually suggest to halve the recipe, if you’re baking for the first time (maybe a dry run before the big day?). Heee… I really hope this turns out awesome for you! Good luck, and I hope to hear from you on how it went! Uh and one more other thing, can I also substitute condensed milk with evaporated milk? Should the measurements be more then? Hi Celia! Thank you for sharing this, it sounds really yummy and I’m planning to try this recipe out for my mom’s birthday next week. (I haven’t baked in umpteen years and I’ve never been a pro to begin with lol). Anyway I have a few novice questions, please bear with me. 1. Can I use bacardi rum instead of brandy? 2. I can use this same recipe to make cupcakes too I suppose? Hi Teng, thank you so much for writing in! I’m so excited that you’re giving this recipe a try, and I really, really, really want this to turn out well for you too. So, I’ll try my very best to give you the answers you need. 1) I’ve never dealt with gas ovens before, but from what I’ve read, if you have gas mark settings on your oven, you can start baking at Gas Mark 4 (350 deg F or 175 deg C) for 10 mins, before turning down to Gas Mark 1 (275 deg F or 135 deg C). Each gas oven varies in their temperature settings, so whatever settings correspond to those temperatures on your oven. It’s to be expected that the oven temperature will take considerable time to reduce. For more reading on how to bake in gas ovens, here’s an article I hope you’ll find helpful. Please note that baking times are often longer in gas ovens as well, so be prepared to bake for additional 15 to 30 minutes or until your cake is baked through. 2) Yes, plain flour is the same as all-purpose flour. This was easy! 3) Yes, you can omit salt if using salted butter. But I find adding just a pinch is good too! 4) I usually use 56 to 60 gm eggs here, so yolks will weigh between 16 to 18 gm each, and whites between 40 to 42 gm each. The step-by-step photos should provide a good, visual guide for you. This makes quite a large amount of batter, Teng, so it might be a good idea to make a smaller cake using half the recipe amounts- it just makes handling and working with the batter a lot easier on your first time. Should you have any further questions, please feel free to ask! I’m happy to help! Good luck and I’m eager to hear how it turns out! 1. I don’t use electric ovens, so how do i lower down the temp (as gas oven doesn’t shift that quick)? What can i do here? 2. Is plain flour the same as all purpose flour? Or should i use cake flour? 3. If i use salted butter, do i omit the salt in the recipe? 4. Egg sizes differ here – what’s the value of egg yolks and egg whites in grams? Sorry for all the questions but i just really want this to be perfect? Hi Therese, yes it is. Hi Andrea, sorry to hear this wasn’t as moist as you wanted. May I ask if you had any issues while making the cake? Were the ingredient amounts the same as per the recipe? It would be helpful to know so that I could get to understand what may have turned out this cake differently, because moistness hasn’t been a problem with this recipe so far. Thank you for your time and feedback! Did not come out as moist as hoped. Hi Forest, 60 to 62 gm eggs are preferred. Happy baking! Hello Celia, 10 large eggs? How many gram for each egg? Hi Ally, if you mean to ask if the amount of sugar can be reduced, then yes, it can, but depending on how much you reduce, do expect that the texture and taste of the cake may not be the same, because sugar also contributes to the moistness of the cake, and golden brown crust of the cake. Generally, I would suggest that for most cakes, it is highly recommended to reduce no more than 20% of the total amount of sugar. Hope this works out for you! Hope to hear your feedback! Hi for health reasons can the amount of sugar?